As Brazil's e-commerce sales grow rapidly, Chinese e-commerce companies are rushing to build their presence in that booming market in Latin America's biggest economy. OSell, a Chongqing-based e-commerce company that specializes in overseas business-to-business e-commerce, is one of them. Positioned as "the Chinese supply chain partner", OSell connects millions of Chinese supplies with overseas buyers. "Brazil is one of four major markets for OSell due to its impressive sales revenue and greater customer participation," said Li Yiling, media-marketing specialist at OSell. OSell entered Brazil in the third quarter of 2013, and now has monthly revenue of $500,000 to $1 million, according to Li. More than 50 percent of Latin America's e-commerce sales come from Brazil. In the first half of 2013, more than 40 million people shopped online in Brazil and the number is expected to top 50 million by the end of 2013, according to a report by Research and Markets. "It is a huge market with a great demand," Li said. OSell's main service in Brazil is dropshipping. "Dropshipping means you do not warehouse stock yourself, but instead transfer customer orders and shipment details to OSell, who then ships the goods directly to the customer,'' the company says on its website. OSell's clients are small- and medium-sized e-commerce owners who already own an online shop, Li said. "OSell will first direct the product data into their website, when ordering happens, it will send the product to the final customer," she explained. OSell has worked with various companies and organizations in Brazil, including the Brazilian association of e-commerce ABComm, market agencies like Rapport and TopDeals and business- related websites such as E-commerce News and Rio Times Online, according to Li. "We are now reaching out to more partners in related fields, and it is sure that more partners will come on board," Li said. China surpassed the US as Brazil's biggest trading partner in 2009. Statistics from the Brazilian central bank show that bilateral trade had climbed to $75 billion in 2012.from $6.68 billion in 2003. With greater cooperation and communication between the two countries, Li said Brazilian businessmen are more open to import goods from China. 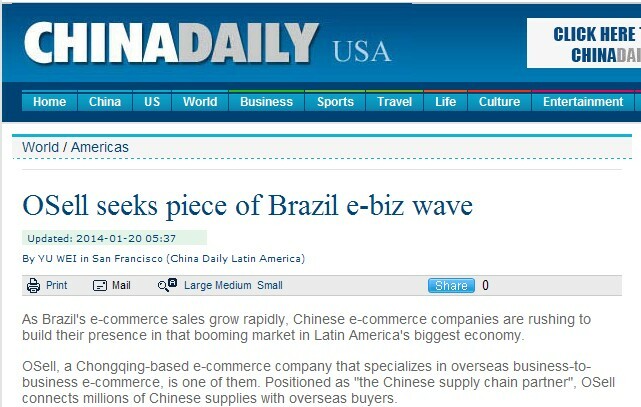 "High quality and inexpensive Chinese goods are gaining popularity in Brazil," she added. To expand in Brazil, Li said OSell is looking for local agents in the country to sign potential clients. The company attended a shoe and accessory fair in Sao Paulo from Jan 13 to Jan 16 to introduce its products and service to clients and to make local connections. "There are some potential deals we made there during the show," Li said.